Staphylococci are commensals of the mucosal surface and skin of humans and animals, but have been implicated in infections such as otitis externa, pyoderma, urinary tract infections and post-surgical complications. Laboratory records provide useful information to help investigate these infections. 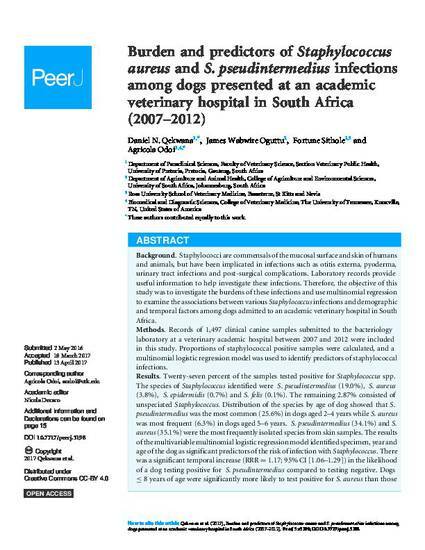 Therefore, the objective of this study was to investigate the burdens of these infections and use multinomial regression to examine the associations between various Staphylococcus infections and demographic and temporal factors among dogs admitted to an academic veterinary hospital in South Africa. Records of 1,497 clinical canine samples submitted to the bacteriology laboratory at a veterinary academic hospital between 2007 and 2012 were included in this study. Proportions of staphylococcal positive samples were calculated, and a multinomial logistic regression model was used to identify predictors of staphylococcal infections. Twenty-seven percent of the samples tested positive for Staphylococcus spp. The species of Staphylococcus identified were S. pseudintermedius (19.0%), S. aureus (3.8%), S. epidermidis (0.7%) and S. felis (0.1%). The remaining 2.87% consisted of unspeciated Staphylococcus. Distribution of the species by age of dog showed that S. pseudintermedius was the most common (25.6%) in dogs aged 2–4 years while S. aureus was most frequent (6.3%) in dogs aged 5–6 years. S. pseudintermedius (34.1%) and S. aureus (35.1%) were the most frequently isolated species from skin samples. The results of the multivariable multinomial logistic regression model identified specimen, year and age of the dog as significant predictors of the risk of infection with Staphylococcus. There was a significant temporal increase (RRR = 1.17; 95% CI [1.06–1.29]) in the likelihood of a dog testing positive for S. pseudintermedius compared to testing negative. Dogs ≤ 8 years of age were significantly more likely to test positive for S. aureus than those >8 years of age. Similarly, dogs between 2–8 years of age were significantly more likely to test positive for S. pseudintermedius than those >8 years of age. In addition, dogs 2–4 years of age (RRR = 1.83; 1.09–3.06) were significantly more likely to test positive for S. pseudintermedius compared to those <2 years of age. The risk of infection with S. pseudintermedius or S. aureus was significantly higher in ear canal and skin specimens compared to other specimens. The findings suggest that S. pseudintermedius and S. aureus were the most commonly isolated species from dogs presented at the study hospital. Age of the dog and the location of infection were significant predictors of infection with both Staphylococcus species investigated. Significant increasing temporal trend was observed for S. pseudintermedius but not S. aureus. This information is useful for guiding clinical decisions as well as future research.